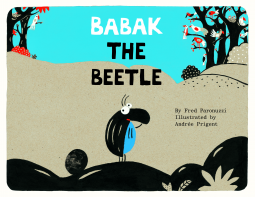 One morning Babak, the dung beetle, finds an abandoned egg and decides to look for its parents. He asks the ostrich, the cuckoo, and the frog, but nobody knows who the egg belongs to. He finally finds a snake who tells him the egg comes from a large field "over there". Without knowing it, Babak happily carries the egg towards the golf court. When he finally arrives he can see that many other eggs like the one he carries are laying everywhere, and he is absolutely terrified to see how the eggs' parent hit them with sticks, making them to fly and fall in holes. What a beastly behavior! No way he is leaving his egg here! Babak carries his egg back where he can take good care of it. If I had to describe this book with one word, I would say "cozy". All about it gives me the feeling of an old book: its simple illustrations in only four colors, the font which reminds me of mimeographs, the pilgrimage style of the text. It looks like a book to treasure. The text is both warm and humorous. And how not to love Babak so kind and gentle? I have always loved dung beetles, and Babak is now among my favorites.